Kavanaugh And Wife To Appear On Fox News Tonight - Joe.My.God. Brett Kavanaugh and his wife Ashley Estes Kavanaugh are set to appear for an interview on Fox News Monday night, the network announced. President Donald Trump‘s embattled Supreme Court nominee will appear for an interview with Martha MacCallum, on her 7 p.m. show The Story, Fox News said in a statement. Kavanaugh will address the two allegations of sexual misconduct that have been leveled against him, as well as his upcoming Senate Judiciary Committee hearing on Thursday “and the effect these claims have had on his family,” per the network’s statement. 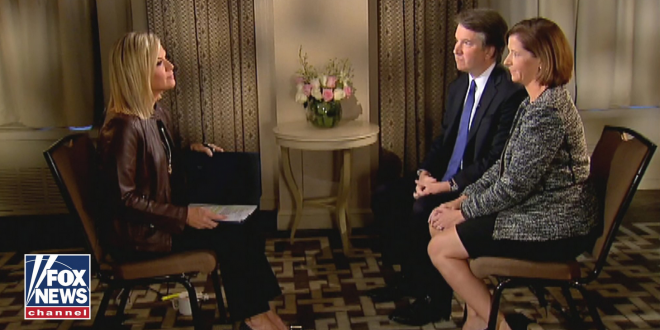 Judge Kavanaugh to give joint interview with his wife to Fox News’ Martha MacCallum – making case in broadcast tonight not just to public but to Senate Republicans and a key Oval Office demographic.